Islamabad: Pakistan’s Supreme Court has decided to form a Joint Investigation Team (JIT) within next seven days to further investigate the charges against Prime Minister Nawaz Sharif and his two sons on property documentation, tax evasion and money trail. The final verdict in famous Panama Papers case was split 3-2 among the bench, with two dissenting notes by Justice Asif Saeed Khosa and Justice Gulzar Ahmad. The two judges ruled against Sharif, saying he should be disqualified, whereas the other three judges were in favour of forming a JIT. The split judgement called for further investigation by Federal Investigation Agency (FIA) and other agencies to examine the case further. Sharif will be required to present before the team which has been asked by the court to submit its report in 60 days. The five-judge bench ordered an extensive probe into the money trail for Sharif family in the Panama Papers scandal citing “insufficient evidence”. “It needs to be investigated how the money was transferred to Qatar,” the verdict read. The judgement was made public 57 days after the case was last heard amid a lot of anticipation among the masses and high security of around 1,500 police force deployed around the Court area for security. 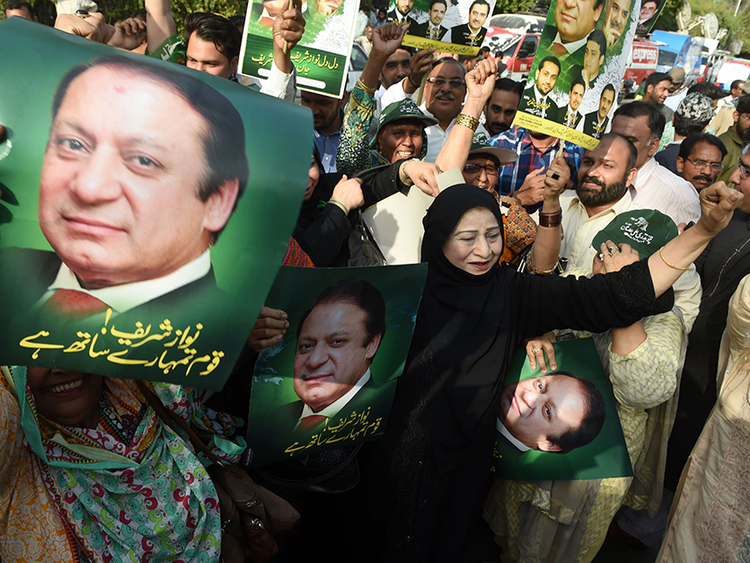 The Prime Minister and his supporters claim the decision as a victory after Pakistan’s Supreme Court announced much-awaited decision on the “Panama Papers” case that was moved by opposition leaders seeking Sharif’s removal from office. The ruling Pakistan Muslim League-Nawaz (PML-N) tweeted photos and shared statements on social media of celebration after the verdict. The Premier’s daughter, Maryam Nawaz, tweeted a photo of Prime Minister Sharif, his family and PML-N leaders celebrating the verdict with smiles. In a press conference after the decision, the opposition Pakistan Tehreek-e-Insaaf (PTI) chairman Imran Khan demanded Nawaz Sharif’s resignation, citing that the Joint Investigation Team cannot work freely and independently without the resignation of Nawaz Sharif. “I demand Nawaz Sharif resign ... Until the Joint Investigation Team (JIT) completes its probe,” Khan said. Pakistan’s Prime Minister Nawaz Sharif and his family came under fire at home for widespread corruption after huge leak of 11.5 million financial and legal records documents known as Panama Papers. Eight offshore companies reportedly have links with the family of Nawaz Sharif. His three children — Maryam, Hussain and Hasan — were owners of offshore companies registered in the British Virgin Islands and used them to buy properties in London, according to the Panama Papers. The case against Sharif family on charges of corruption was presented by the Opposition parties Pakistan Tehreek-e-Insaaf, the Jamaat-i-Islami (JI), the Watan Party and the All Pakistan Muslim League, demanding PM’s resignation over alleged corruption. What do Pakistanis think of the Panama Papers verdict? Most Pakistanis were critical of the verdict by Supreme Court of Pakistan to form a Joint Investigation Team to further investigate the corruption and money laundering case against Prime Minister Nawaz Sharif and his family members. The media had created a big hype since last 48 hours on the issue, but broadcast critical reactions of the people yesterday. Pro-government political activists termed it as a victory but opposition leaders and activists appeared dissatisfied with the decision to hold further investigation. Political activists on social media posted sarcastic comments on the verdict within hours of its announcement. Nawaz Sharif is a veteran Pakistani politician and businessman, who was the elected the nation’s Prime Minister twice and is currently serving his third term. His family businesses revolve around steel, sugar and textile industries. In 1993, Sharif’s government was dismissed over charges of corruption but was reinstated by the court. After an October 1999 military coup ousting his government, Sharif went into exile in Saudi Arabia until 2007. He was elected prime minister again in June 2013. Nawaz Sharif has two sons and two daughters. Last April, the Panama Papers revealed that three of Sharif’s children controlled shell companies through which they owned expensive residential properties in London. Hussain, who is one of the accused in the Panama Papers. Maryam is currently the chairperson of PML-N Youth Wing, and enjoys a fan following of 3.11 million on Twitter. The elder son of Nawaz Sharif, Hussain is settled in Saudi Arabia and looks after the Sharif family business. In the past, he has admitted to owning two companies for the family. The younger son, Hassan Nawaz Sharif is settled in London and is responsible for his family business. It is believed that he owns major shares in the Nawaz family’s steel mills in Saudi Arabia. The Supreme Court of Pakistan has formed a Joint Investigation Team (JIT) which will now take statements of Prime Minister Nawaz Sharif and his two sons Hassan Nawaz and Hussain Nawaz to collect evidences of bank transition and money transfer trails, which made them possible to purchase London flats and other businesses abroad. The terms of references of the probe body will be devised by the apex court. The JIT will decide the matter in a stipulated period of 60 days. Services Intelligence (ISI) and Military Intelligence (MI) and will be led by a director-general level FIA officer. According to the court orders, the names of members of the JIT must be announced within seven days. The JIT would report its progress to the court on a weekly basis. A bench of the apex court will examine the case under Section 184/3 of the Constitution. April 3, 2016: Prime Minister Nawaz Sharif and his family came under the spotlight after the Panama Papers (11.5 million secret documents) were leaked by the International Consortium of Investigative Journalists which revealed a global web of corruption and tax avoidance. April 5: Due to mounting pressure, Sharif addressed the nation and announced to form a judicial commission to investigate the offshore firms owned by members of his family. April 22: In a second state address, Sharif vowed he will resign and go home if proven guilty by the Panama Papers investigation. May 18: Pakistan government and opposition agreed to form a 12-member committee for an inquiry commission to probe the Panama Papers. October 20: The Supreme Court of Pakistan accepted petitions filed by Pakistan Tehreek-i-Insaaf, Jamhoori Watan Party, Jamaat-i-Islami and others to begin the proceedings on Panama case in an open court. November 7: Sharif’s children Maryam Nawaz, Hussain Nawaz and Hassan Nawaz submitted their replies to the court which stated that Sharif’s two sons have been living outside Pakistan for a very long time and their father had no involvement in children’s businesses or properties. It added that Maryam was not the beneficiary owner of the off-shore companies, Nielsen and Nescoll, but only a trustee. November 16: Sharif family submitted a letter purportedly written by Qatari Prince Hamad Bin Jassim in which he claims that the London properties were purchased through the settlement of accounts between his family’s company and the Sharif family. January 26, 2017: The Sharif family submitted another letter signed by a Qatari royal which claimed that Mian Muhammad Sharif (father of Nawaz Sharif), had invested 12 million dirhams in Al Thani family “by cash”. February 23: After prolonged hearing, the Supreme Court reserved its verdict on the case and said a detailed judgement to be announced in April. April 20: Supreme Court announces its much-awaited verdict. While Nawaz Sharif got a reprieve, the Supreme Court ordered he should be investigated further for corruption.